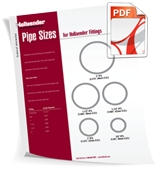 This guide is designed to print at actual size to assist you in finding the correct fitting size. Metropolitan Pipe stocks everything you need to start of your project with Nurail® fittings. Handrails, guardrails, playgrounds and carts, store fixtures, offshore petro/chemical, industrial plants, racking systems, warehouses, health & medical buildings, portable structures, recreational areas, amusement parks, film, public works and much, much more. Whether you're designing a playground, queue rail, material handling cart or railing around the Space Shuttle launch pad at the Kennedy Space Center, Hollaender and Metropolitan Pipe has a mechanical fitting system to meet your needs. Our products and services are now the standard for quality in a broad range of industries.